The WKN Chopin Project has been given approval for 33 new turbines just southwest of Milton-Freewater, west of Highway 11 and Lower Dry Creek Road. Approval for the transmission line was not approved, and WKN has appealed the UC Planning Commission's denial for the transmission line that is planned to go directly east to the Blue Mountains. As mentioned before, the proposed turbines are Vestas V112, 3 MW, with an overall height of 459.3' high from the ground to the tip of the highest blade at 12 o'clock. The land the industrial wind turbines will be built on is over 1600' above sea level, add the 459' wind turbine structure and they will be towering over the landscape more than 2059' high. Although the hill between us is about 1600' at the highest point, the industrial wind turbines will be visible from most areas of the City of Milton-Freewater. Our County has been sidestepping this point, using the less-than-honest information provided by WKN of a non-existent point they call "Old Town Milton-Freewater". From this "point" their project will not be seen. Ignored is the entire south portion of Milton-Freewater where it will be totally visible. The southern part of the City also includes the urban growth area that Milton-Freewater has invested several million dollars to prepare for future development. This new generation of industrial wind turbines will dwarf the previous wind turbines already in place in our area and be quite visible for miles and miles around, including the panoramic views from Tollgate Highway, Hwy 204. There is another issue that has not been discussed in public, noise. Milton-Freewater is only a little over 3 miles from this project and will be downwind from it. What does that mean? It means that is the same direction the wind usually blows and will carry that noise to the City of Milton-Freewater and the surrounding area. 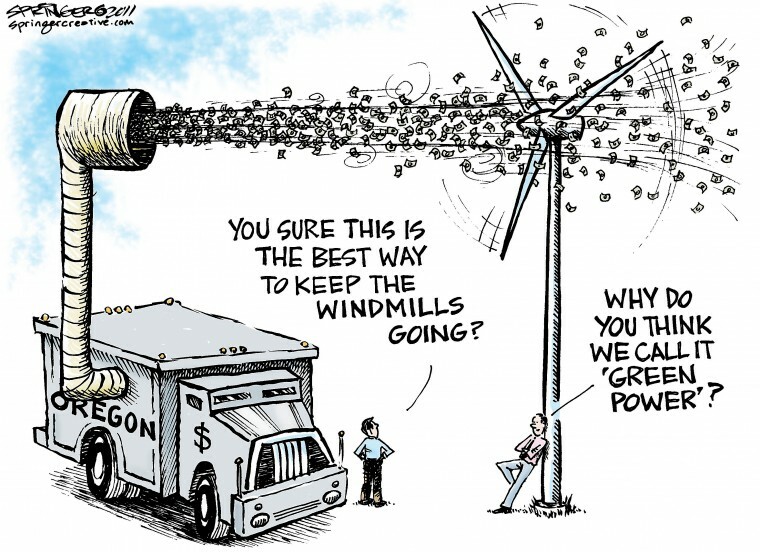 2012 is an important year to stop the bleeding of taxpayers money to the big energy corporations. We need to focus on members of the Senate who are at home in their districts. The Senate does not reconvene until January 23. What we know: The Senate's tax extender package failed in December. Nonetheless, it included extensions for BOTH 1603 and the Production Tax Credit and these will return either as part of the Conference Committee debate on the Payroll tax holiday (HR 3630) or via other legislation. Conference committee rules prohibit negotiations from considering provisions outside of the bills passed but Harry Reid has already signaled "everything is on the table". What we need to do: Please call the LOCAL offices of your senators TODAY. Ask for their schedules during the recess period. Find out when/where your Senators will be holding townhall meetings. If NO townhall meetings are planned, ask politely for him/her to schedule a meeting at home before January 23. 2) Encourage your Senator to hold firm and inform the leadership and Senate Conference Committee members that he/she does not support extension of Section 1603 or the PTC. If you see something you like, or can't find something you think we need to have in our website, send us your comments to webmistress@bluemountainalliance.org. 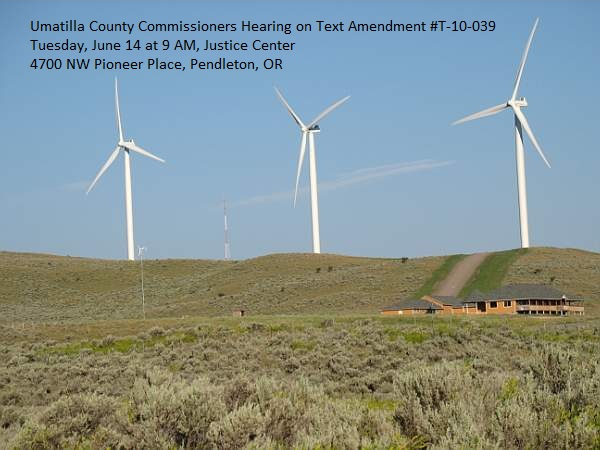 Public Review of the Draft "Wind Energy Health Impact Assessment"
A public review of the HIA draft report about the health of people living near wind turbines, produced by the Oregon State Health Department. Input from this meeting will be condensed down into a form letter or e mail that can be sent by our citizens to Salem. So bring any/all information or questions you have regarding this document and join us! A copy of the HIA draft can be downloaded here. Public comments can be submitted to the State until 5 PM March 30, 2012. When will be it be too much? This beautiful home in Union County is no longer habitable since the Elkhorn Wind Project was built by Horizon Wind Energy in 2007. Click on the picture above to view full size. Copyright © 2011 Blue Mountain Alliance. All Rights Reserved.